Opening our first Tasting Pavilion was a major undertaking in and of itself. Deciding on and then creating offerings for our new home presented a new set of unique challenges. The menu process began several month’s prior to the actual building of the tasting pavilion. Originally, we planned to offer a simple menu of Crumbzz Cakes, coffees and tea’s. As our vision of the tasting pavilion morphed into its current iteration, we realized we would need much more than the planned simple menu to compliment our beautiful new home. Our first egg dish was a pretty logical creation from an economic and environmental sense. The making of our crumb cakes leaves us with an enormous amount of egg whites. Making an egg-white omelet solved not only the economic and environmental issue but also provided our tasting pavilion guests with a healthy breakfast alternative. To make our omelet special we added garden fresh baby spinach and just the right amount of parmesan. Light and fluffy, our egg white omelets are now a big hit at the tasting pavilion. We worked month’s on getting our process down to where we had confidence we could produce a superior product every time. Our Béchamel is one of the keys to our success. It is light and creamy and adds a wonderful silky texture to each soufflé’. We set about polling the industry and using the greatest research tool in the world (the Internet), came back with the Liège. In the U.S. chains use inferior sugar (because of cost) or produce substandard pre-made frozen balls of dough from Europe (because of the savings in labor and time). Our research led us to a small waffle maker in Liège Belgium who tirelessly worked with us to produce “authentiek” Liège Waffles. 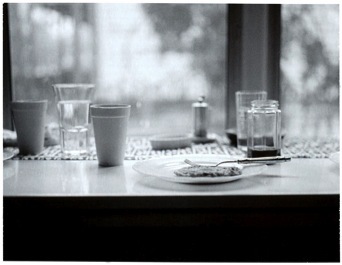 Two month’s and $3,600 later, we had our waffle maker and were on our way to constructing our very own Liège Waffles. Just as we used my dad’s family recipe for our crumb cakes, my mom’s family recipe provided the basis for our Gamberia Blueberry Ricotta Pancakes. Named after the beautiful Villa Gamberaia in the hills of Florence, where my mom’s family heritage originated, our Gamberaia Blueberry Ricotta Pancakes provide our guests with a uniquely Italian twist on the traditional pancake. There are two things to look for in a good quiche, the fluffiness of the eggs and the flakiness of the crust. 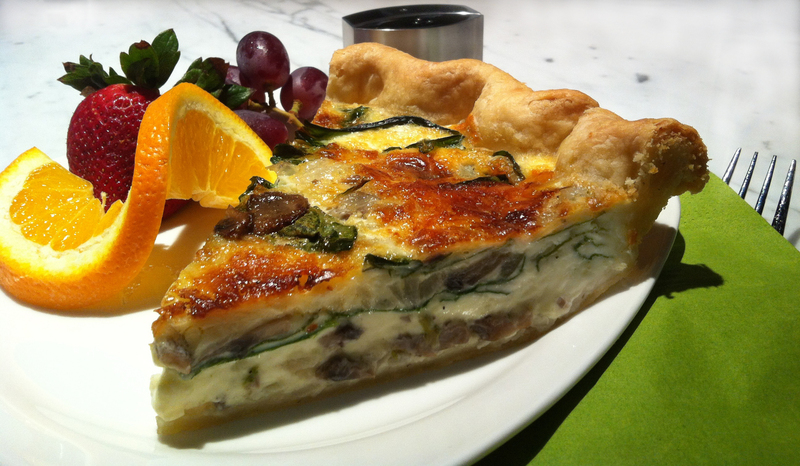 Fresh made quiche has a light flaky crust and a light creamy feel. There is only one way to achieve this balance and that is to make your quiche from scratch. And that means not only the egg and vegetables but also the crust. Add garden fresh vegetables and you have the makings of a true culinary delight. Our Mushroom Spinach Quiche is not only a beauty to behold but also an exquisite dining experience that you won’t soon forget. Eggs whipped to perfection, light flaky crust that bursts with home cooked flavor and vegetables that provide the finishing touch of fresh picked garden flavors. With the addition of fresh strawberries, grapes and orange garnish, our quiche has become a wonderful light breakfast or lunch for our Tasting Pavilion guests. As ice cream lovers, we knew it would only be a matter of time before we produced ice cream at our tasting pavilion. In addition, many of our clients love the idea of adding a dollop of ice cream to our crumb cakes. And so, we set about creating our very own ice cream. Cinnamon streusel is the flavor of our signature crumb cake and it was the original flavor in the family recipe, and so Cinnamon streusel carried on the tradition of being the first flavor of our homemade ice cream. With the addition of a wonderful Garden Gourmand Salad that features garden fresh baby spinach, toasted walnuts, cranberries, homemade parmesan croutons and a spritz of light raspberry vinaigrette, our menu lineup was complete and the total package of beautiful ambiance, wonderful music, and exquisite dining offerings made our Crumbzz Forney Tasting Pavilion what it is today… a place to enjoy great friends, great food and life as it should be.